Thai food is one of our favorite cuisines. For years, there wasn’t a Thai restaurant in the town we live in, so I started learning to cook Thai food. A new Thai restaurant recently opened in town, so we decided to try it out. While it was okay, it wasn’t what we were used to having in San Diego. Brian said that my Thai food is much better and he’d rather eat my home-cooked Thai food – that made me feel good since I’m still relatively new to it. 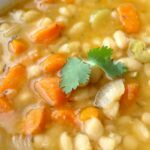 I have always loved soups, so I recently started making this Slow Cooker Thai Coconut Soup recipe. It is so amazingly good! You can either eat it as a soup, or you can make rice to go along with it and have it more like a sauce. Either way, if you like Thai food, you’re going to love this easy-to-make recipe! In your slow cooker, add the coconut milk, red curry paste, lemongrass paste, chicken broth and sliced mushrooms. Turn your slow cooker on low, and allow the mixture to cook for around 4 hours. Add the chopped chicken, fresh lime juice, salt and pepper, then cook for another hour. Ladle into serving bowls and top each bowl with a bit of cilantro. You can also serve over with rice for a heartier meal. This looks delicious! I miss Thai food since our little one has a peanut allergy and the restaurants pose too much of a threat of cross contamination. I bet I can source all of this from nut free companies. Thanks for sharing! Did you find any peanut free curry paste? I think VH has a peanut free curry sauce but probably too liquidy. There are not peanuts in the brand I use, but it is made in a facility that uses peanuts in other products. Um… YUM! I really need to stock my shelves with thai ingredients. I have never made any thai foods but they always sound so good! I am such a sucker for Thai Coconut Chicken soup, especially when it’s brutally cold outside. Sounds delicious – we’re going to have to try it soon. We have some coconut milk we should use up. I grew Lemongrass last year just for this soup! Great recipe — I hadn’t thought to make it in the slow cooker. I like the idea of having it scent the house all day. This soup has always been very soothing and healing for me. Your soup sounds so good! I love the taste of coconut milk and lemon grass…. this is making me so hungry! I love anything with coconut milk. I grew up eating lots of them and still do 🙂 This recipe looks delicious and yum ! I had to take a closer took at your recipe after see it at the weekend social blog hop! Great crockpot recipe. Looks delicious. Mmm, my husband loves Thai food I am definitely going to give this a try it looks delish! Found you on Saturday Sharefest & loving your blog! This looks yum! I suppose it’s time for me to get a slow cooker. This will be my first recipe. I always order a soup like that when we order Thai food. I’m totally going to have to try to make my own! G’day! Looks healthy and delish! Wow, I’m so happy I found this recipe on the TGIF link up party! We grew up in Thailand and miss Thai food like crazy, but it’s kind of time consuming to make it on a regular basis. This recipe sounds like something we can do and I’m sure the kids will be thrilled! BTW, where did you find the lemon grass paste? I just got the lemongrass paste at the grocery store (Vons) in the product section. This was good. I added thinly sliced carrots and green peppers. Also some broccoli.